From the outset, I should point out that in order to find out whether a good qualifies or not for being called money the most important question is this: is there a price system expressed in that good? If the market participants exchange or intend to exchange virtually all goods produced against that good, in certain proportions, then that good is money and allows for economic calculation to be performed and offers all the advantages that spring from its production and storage. They ask if it’s not too late to make the case for gold and silver as money in today’s world, given the present demographic abundance and greatly increased productivity. Are we not too many people on Planet Earth and don’t we have too many goods and services to exchange for gold and silver to be sufficient? From the above quotation we can extract two useful ideas: money is chosen by the market and not by theorists stricken by nostalgia or aurophilia. The only universally valid statement on the choice of money is that it can only be a commodity money, with a certain market use and value before becoming money (See the Misesian regression theorem). Now, whether the commodity money chosen by a hypothetical free market of the future will again be gold, silver, both, or an entirely different commodity, is something that we cannot know with certainty. Economic theory does not help in that regard. The period in which monetary use of gold and silver enjoyed most of its freedom, even that being relative and never barred from government intervention, extended from the beginning of nineteen century and began to decline with the outset of the First World War. The final blow against the gold standard was dealt in 1933 by the F.D. Roosevelt regime, when gold was nationalized in the United States. Thus, one can state that until 1933 gold and silver were used as money on the free market. If they say that the present rate between the existing quantities of gold and silver and the number of living persons suggests a physical impossibility blocking the two metals’ road back to monetary glory, let’s see how this rate has evolved over time. Recently, the global quantity of gold was estimated at 156,750 tons (2009 estimate) and the world silver stock at 24,883 tons (2008 estimate). World population was considered to be 6,800,000,000 in 2009 and 6,707,000,000 in 2008. We can thus calculate an „impossibility ratio” of approximately 23 grams of gold per person in 2009 and one of some 3.71 grams of silver per person in 2008. Apparently, these ratios show by themselves that gold and silver are doomed as far as their monetary ambitions go. But if we put this indicator in historical perspective we stand in for a surprise: in 1900, at the apex of the gold standard, the ratios stood at 9.13 for gold and 165.6 for silver; in 1930, at the set of the gold standard, the ratios were 16.37 for gold and 230.84 for silver. If this way of thinking has any value at all, then we can conclude that gold is more ready than ever for a monetary comeback whereas silver has become too scarce to be used in daily market exchanges, due to its commodity—as in other than monetary—demand. To further analyze the chances of silver, let’s imagine that its monetary demand suddenly takes off, increasing its price to, let’s say, $80/ounce so as to broadly reach a ratio of 15:1 to gold. Let’s further suppose that this drives out virtually all its non-monetary demand. Given that the ratio between existing stock and annual production is around 1:1 for silver, this means that even if all silver consumption would be stopped and the world population would stay constant, at the current levels of production, we would need approximately 65 years to reach the „impossibility ratio” of 1930. And the critique of silver and gold does not stop here. Besides population growth, the world productivity has increased immensely in the 80 odd years since the two metals ceased to be ordinarily exchanged it the markets of the word. World production has diversified and has grown in volumes. So, even setting aside the problem of population, the purchasing power of gold and silver would have to be much bigger than before in order to intermediate so much many exchanges. That is, the prices expressed in gold and silver would have to be small, tiny, and as the world productivity keeps on growing faster than the precious metals stocks, the prices should continue decreasing. Could the markets manage daily trade under such conditions? The answer from economic theory is a firm yes! Notwithstanding the inflationists (stating that the economic system can function and grow only by circulating proportional and proportionally growing volumes of money) and the ones nurturing deflation phobia, it’s not the level of prices that is important for the orderly exercise of economic calculations and the correct measurement of profit and loss. Several great monetary thinkers have proved again and again that any quantity of money is optimal from an economic perspective. But, true enough, not any quantity is technically feasible. Just as during hyperinflationary times we transport our money for daily shopping by the wheelbarrow or the sack, and we cannot consider this arrangement advantageous at all, one could object that for gold and silver to return now to the market we would have to make ordinary payments in quantities visible only through the lens. In other words, we face divisibility, transportability, and manipulation difficulties. But divisibility is a false problem, because precious metals excel at this characteristic. At this point we should notice that the grain, defined as the 480th part of an ounce, used to be a traditionally popular measure of precious metals. This suggests that we could have a price system expressed in grains that could allow for the exchange of even the least valuable goods and services. But how about transportability and manipulation? One quick answer that comes to mind is this: the innovations that made possible the current increased productivity could be applied to solve the transportability and manipulation problems. Today, we have the card payment system. Let’s put aside for a moment all the inconveniences associated with this payment method —and with any other monetary substitute, for that matter—under the present fraudulent monetary arrangement based on fractional reserves. Under a 100% reserve metallic standard, card payments, which are nothing but an evolved check payment method, could solve the bulk of small payment transactions, the ones for which the actual exchange of the metallic money is impractical. 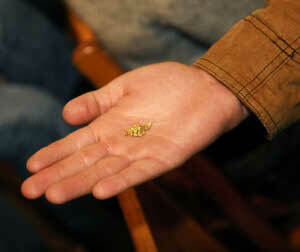 At current prices, a grain of gold is worth around $2.6 and one of silver approximately 3.75 cents. Could we imagine that we go shopping to the supermarket and pay with the card for goods amounting to a few grains of gold or a few hundred grains of silver? I don’t see why not. Then, beside the credit or debit card, there are all the classic payment instruments: the check, the money order, and even the paper or plastic banknotes, all expressed in metallic money this time. Indeed, banknotes could receive a completely new meaning than the one they have now. If today paper banknotes are fiat money and ex false certificates without coverage in any true commodity money, such as gold or silver, they could become again part of a certification system. However, this time they would be a certificate embedded (or physically integrated, to use J.G. Hülsmann’s expression) with money proper. The new banknote could be a simple paper or plastic support for small quantities of precious metal. The gold leaf or the sputtering methods make it possible for such innovative products to be offered today. Thus, the manipulation and transportation of infinitesimal quantities of money could be solved in manners that would fill very popular present habits with new meanings. To sum up, one could speculate that, should the world return to monetary sanity, the traditional role of silver will be taken up by nickel or copper, and that gold will regain its function as the generally accepted medium for big transactions. But technical progress and human action with its surprising shifts in preferences could give us a completely transfigured future monetary system. If history does indeed teach us many things, only theory can give us certainties. And for the monetary realm we can only know for sure that we need liberty and at least a commodity money, whichever shall it be. And if we do not have such money yet, the fault does not belong to the economic laws or some technical impossibility, but to the government’s power of enclosing us in the monetary hell of permanently inflated fiat money and ever bigger cyclical crises, for the sake of optimizing wealth extraction in favor of itself and its privileged accomplices.